When a recipe starts with this much chocolate and butter, you know it’s going to be a good one. You should know that Nick and I are big brownie fans. We almost always have a box stashed in our cupboard for that all-too-common late night chocolate craving. We’ve tried a handful of homemade recipes, too, but have found none that yield the consistency that comes from the box. Until now. Two types of dark chocolate and a teaspoon of instant espresso create a deep intensity of flavor. Five eggs yield a chewy bite, but leave the top just the right amount of crackly. And think they’re good out of the oven? Just wait until the second day. 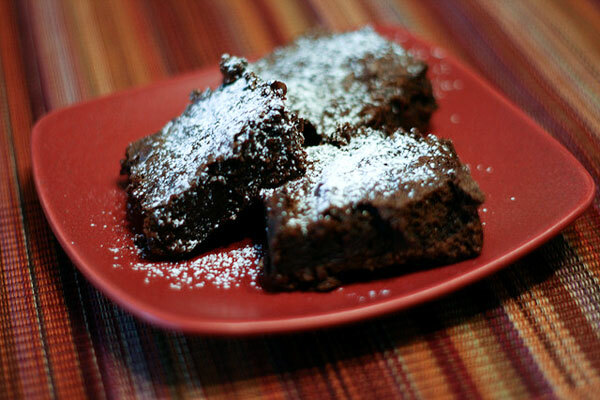 Do you have a favorite homemade brownie recipe? Preheat oven to 350°F. Butter sides and bottom of a 9×13-inch baking pan. 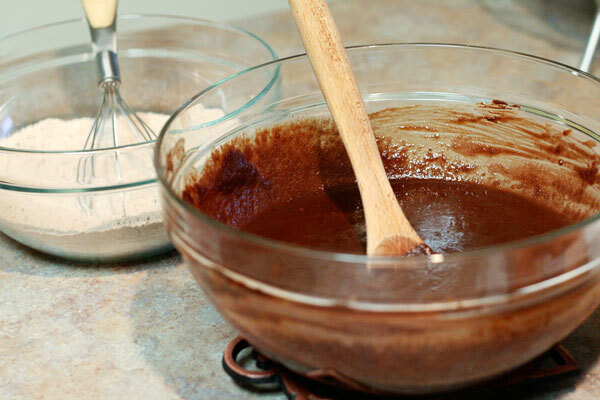 In a medium bowl, whisk together flour, salt, and cocoa powder. Put chocolate, butter, and instant espresso powder in a large bowl and set it over a saucepan of simmering water (or use a double boiler). 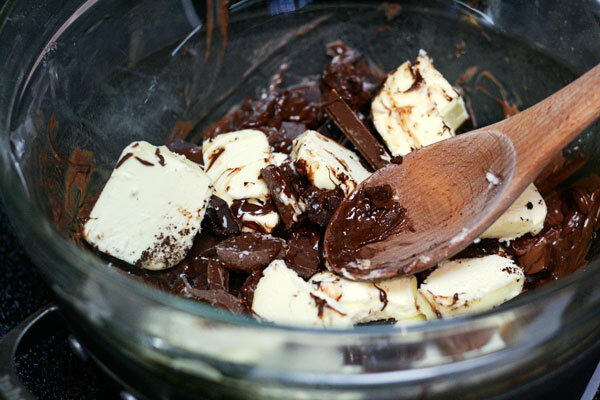 Stir until chocolate and butter are completely melted and smooth. Turn off the heat, but keep the bowl over the water and add sugars. Whisk until completely combined. Remove the bowl from the stove. Cool mixture to room temperature. 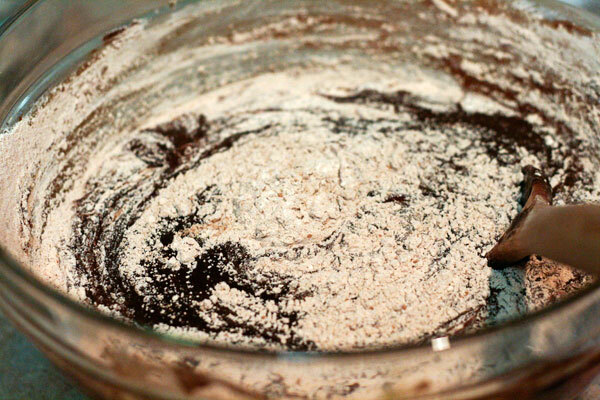 Sprinkle the flour mixture over the chocolate mixture. Use a spatula (not a whisk) and fold together until just a bit of the flour mixture is visible. Pour the batter into the prepared pan and smooth the top. Bake in the center of the oven for 30 minutes, rotating the pan halfway through baking time, until a toothpick inserted into the center of the brownies comes out with a few moist crumbs sticking to it. Cool completely, cut into squares, dust with powdered sugar, and serve (with a tall glass of milk). Yay!! Best brownies ever. And you definitely need their books – both of them! Excuse me as I just drooled on my keyboard. 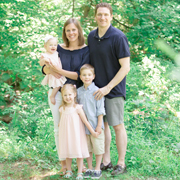 On another note – i love the photos! They’re great! Do NOT, ever again, take the train to NYC. Megabus will get you there faster and cheaper, with WiFi to boot. Amy and I went about a month ago for $18, express round trip from State College…for BOTH of us! You’ve gotta book your seats as early as possible, but it can’t be beat. Oh, and another question. What’s the obsession with unsalted butter, when nearly every recipe that calls for it also calls for salt at the same time? I’ve seen this time and again, and it never makes any sense to me. Why couldn’t you use salted butter and add less salt? Is there really something to this? I always prefer unsalted butter — even more so in cooking than baking. I just like to control the amount of salt in a dish. Also, I almost always use kosher salt over regular salt. Of course … I suppose you could use salted butter and cut out the extra of salt in most recipes.